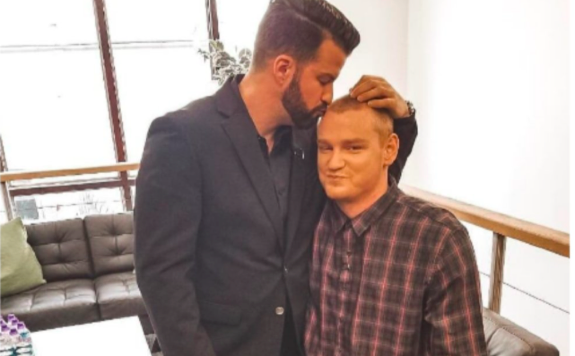 Frenemies Johnny Bananas and Wes Bergmann of The Challenge have taken their bantering shtick to the set of The Maury Show to put their longstanding feud to rest. According to HollywoodLife, the foes will reveal the results of their Maury Povich-issued lie detector test on an upcoming episode of 1st Look TV—the weekly show currently hosted by Bananas himself. In a preview for the May 11 episode, Wes, Johnny and Maury all appear to have fully committed to the talk show’s big-reveal format, with Johnny jumping for joy at one point and possibly getting emotional at another. Johnny shared the preview with his followers on Twitter, while also taking an opportunity to hit Wes with a dig, per usual. “Wes may be able to outwit a bunch of dumb rookies, but can he outsmart a lie detector? The answer to this, along with many other questions will be revealed on @1stlooktv when we take our beef to @TheMAURYShow 5/11,” he tweeted. Johnny and Wes hinted at taking their rivalry to Maury’s show last month during a social media “feud” in which the two went back and forth arguing over who was more obsessed with the other… as all grown adults do. As The Ashley previously told you, it was revealed that Johnny and Wes had actually already filmed a segment for ‘Maury’ before publicly reaching out on Twitter to the talk show host. The ‘Maury’/‘Challenge’ crossover event airs Saturday, May 11 on 1st Look TV! LOL, both have a lot of feuds, no wonder they were both on all three seasons of Rivals. I’m still team Wes though, never liked Johnny. Why exactly are they “beefing”?